This week's update was delayed a day because we spent yet another night out on a beach waiting for You-Know-Who to do You-Know-What--but she didn't. Of course, that doesn't make us any less tired. Yesterday meant we didn't get to bed until past 2 AM and we still had to complete this update. We had a lunch. We had chairs. We had a see-in-the-dark infravision nightspyscope. Only thing we didn't have: 5690. We might as well start with one of the true highlights of the summer: we resighted Zeus at South Park on one of our rare morning dives. We can't say that he was happy to see us. When Ursula saw Zeus at one of his favourite resting spots, the old guy took just a few seconds to decide that Ursula wasn't welcome in his Universe. Zeus flippered her. Ursula backed off immediately and turned her attention to other turtles before once again approaching Zeus. Perhaps it was because this time, Peter swam over to Zeus first, but whatever the reason, the big honu condescended to letting us approach and even take photos. We don't see Zeus much any more, but we're happy just knowing he's healthy and around somewhere. Zeus looked terrific--healthy, grand, and regal. It was so good to see him again. We love Zeus. For the last few summers, going to the Turtle House was simply depressing. 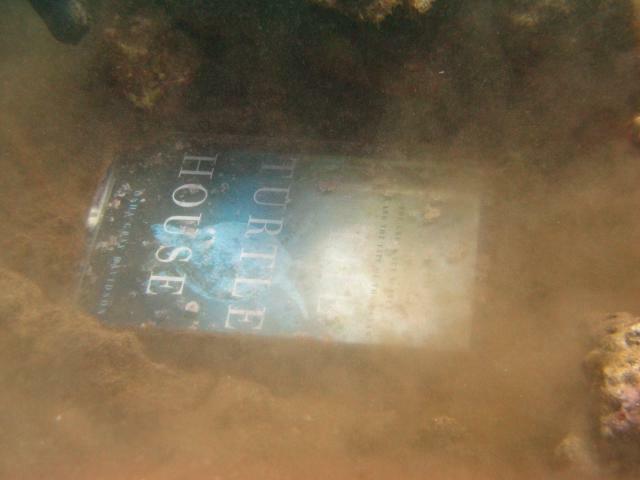 The Turtle House was once a place of Magic and Discovery. 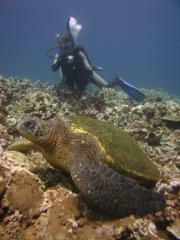 Back in the late 90's we could count on over a dozen turtles there on any one dive. Over the last few years the Turtle House had become an algae-coated Ghost Town. The only things missing were tumbleweeds and of course, turtles. The honu had simply abandoned it as a hang-out. As we said, depressing. This summer we noticed something odd. When we looked at the Turtle House from our lanai through our trusty old binoculars we actually saw turtle shells surprisingly regularly. This week on a kayak-snorkel survey, Peter checked out the Turtle House for the first time. To his surprise and delight, he looked down to see eight turtles there and another five at The Rock. It was like going Home again! So we decided to take a dive at the Turtle House to see what's changed. Arriving at The Rock we saw three turtles sheltered there. Going over the Rest Site and across the sand channel (my how often did we do this in The Old Days!) we saw five turtles. 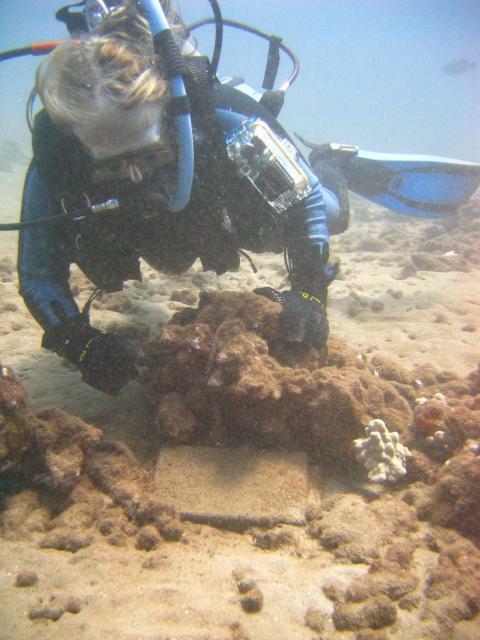 Yes, not the eight Peter saw in his snorkel survey but five more than we'd seen the last few times we'd visited. We were happy to see turtles at the Turtle House. In 2002, we anchored the book "Fire in the Turtle House" at the Turtle House as a memorial to the honu who died of fibropapilloma. As we've done every summer since, we checked on its condition. Ursula prepares to wipe away a year of silt. It was still there, tucked in the lee of even the fiercest winter wave, and was covered with fine silt. Sweeping it clean, we could see colour and words. Still there, still looking good. Great news! The plastic case has held for another year. 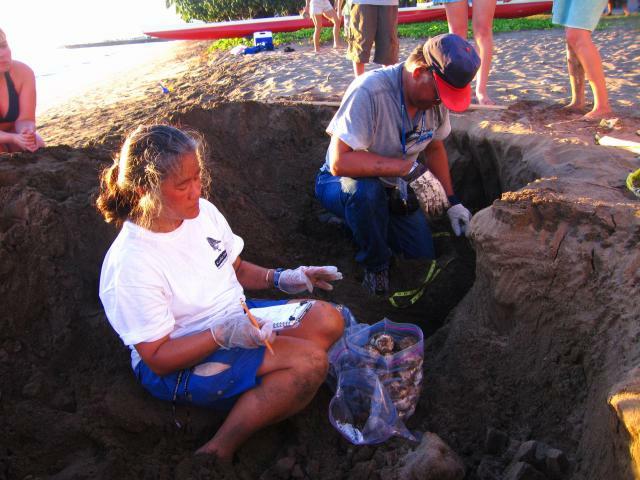 This summer for the first time, we were invited to an excavation of a hawksbill ('ea) nest at the Kihei-side of the island. We'd never seen baby hawksbills before so we had powerful motivation to attend. My, there were a lot of people! 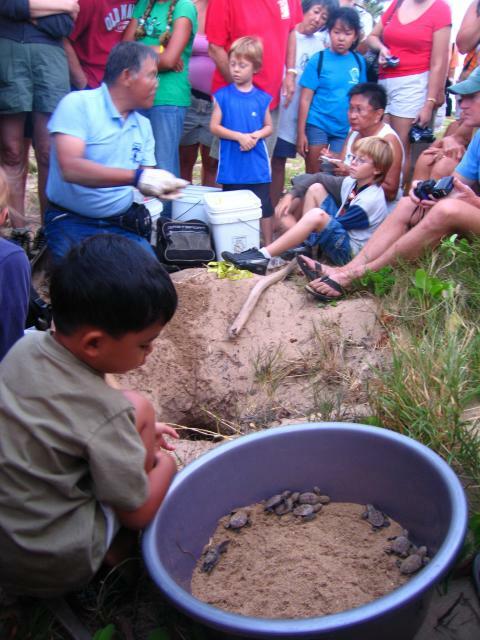 Clearly, hawksbill excavations draw a much bigger crowd than honu do. It was difficult to get a really good look at the goings-on. With each new baby 'ea plucked from the sand, the crowd applauded and released satisfied sighs. A few used the old "Ooooohhh!" when a baby hawksbill was transferred into the baby hawksbill bucket. Eventually, 23 hatchlings were rescued--22 to be released that evening, and one that would need another night to gain a little strength. Hawksbill hatchlings in a bucket. With the excavation complete, sunset came and went. People now took positions--essentially two diverging lines stretching from nest to ocean. 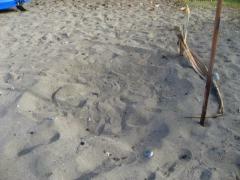 This defined the area in which they would release the baby turtles and let them walk down the beach on their own. Sunset came and went. Dusk gave way to night. 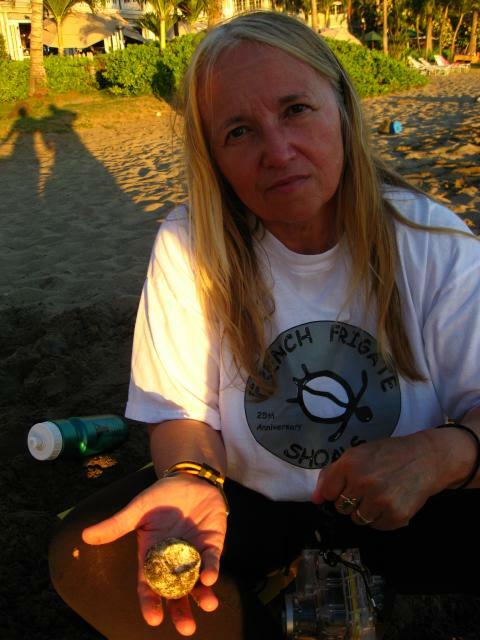 In the darkness, Skippy Hau, assisted by Cheryl King, lowered the kiddies onto the sand and if there were 21 hawksbill hatchlings flopping their way to the ocean, we'll have to take their word for it because neither of us could see a thing. We were told all 22 made it safely into the ocean. Ursula did feel something somewhat hard nudge her ankle at one point. Could've been a small piece of coral tossed by a wave. Could've been a baby hawksbill. We respect the Kihei side hawksbill patrollers because of their supernatural ability to see in the dark! The hawksbill excavation (what we could see of it) was uplifting. The excavation of 5690's nest 2 was anything but. Talk about depressing! As we've related in previous reports, we've spent much of the summer babysitting hatchlings. First there was Nest 1. We watched several weeks of Nothing. When Nest 1 was finally excavated, we'd dug one huge pit and found just what we had expected: nothing! Nest 2 delivered the same dreary schedule. Late evenings drives to Lahaina to peer down into sand and--nothing. At Friday's excavation, we feared another serving of Nothing. Well, sadly, we learned there's something a lot worse than finding nothing. Skippy Hau and Glynnis actually found something this time. Only a few inches from the surface, Skippy discovered one hatchling. Dead. The first egg was discovered--partially hatched. The hatchling's head showed through the shell. Also dead. Then came the next egg. Undeveloped. The next egg. Undeveloped. Then the next. Then in dreary sequence, one after another, all undeveloped. The high tides of the last month had wiped out an entire clutch. Glynnis and Skippy go solemnly about the not-fun part of their job. Only the two top eggs (probably the last two that had been laid) were high enough above the high water mark to develop at all. Only one youngster successfully hatched out of 92 eggs. The tiny hatchling simply couldn't complete the process of getting to the surface on its own and died in the attempt. One of eighty-nine undeveloped eggs. It almost would have been better to find nothing. Friday night, just hours after the excavation of her second nest, 5690 returned to nest for her seventh time this summer. We conducted one walk down the beach at 10:45, saw no tracks, and simply concluded that she would not emerge. We didn't wait until our usual cut-off time of midnight. We were just too tired and yearning for a soft pillow and a place to lie down that didn't have sand in it. There comes a time when not only your body isn't willing, but neither is the spirit. In hindsight, we now know we called it a night far too early. 5690 did show! 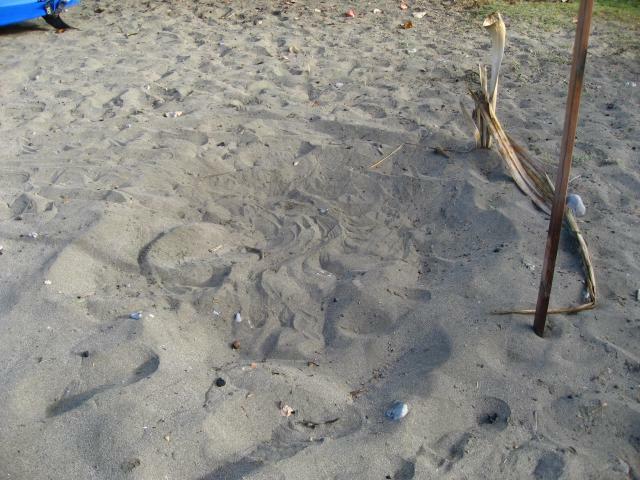 The four sets of tracks we saw the next morning showed the turtle had an active night. One crawl she made along a seawall was the longest we'd ever seen her make. Worse, there in the sand was a depression. Someone had marked it, clearly thinking it was a nest. Maybe it's a nest. Maybe not. To our eye, we don't think it is. Just too shallow, too small, too subtle, too not-nest-like. The only way to know for sure though was to come back to the beach the next night and await her return. If it wasn't a real nest, 5690 would return. 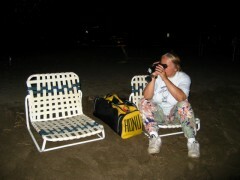 Saturday night, we stayed on the beach until 1:45. No turtle. Could it be that we are so wrong about what a nest should look like? So tonight, Sunday night, we have another late night on the beach. Apparently, it's not uncommon to skip an evening, and the night prior was a particularly taxing one. Nest? Or no nest? Sunday night watch should tell us. On Wednesday, we went to the Queen Ka'ahumanu Shopping Center to look for picture frames, and who do we see in a large poster ad for the Hawaii Government Employee's Association but Skippy Hau, smiling his best. Great poster! 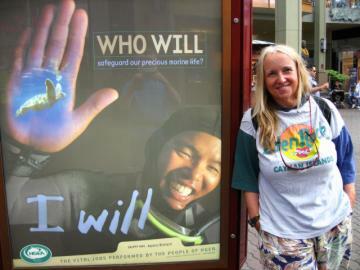 Ursula, wishing she'd worn a different shirt, poses with Skippy.